Apple may be ready to backtrack on Steve Jobs's feeling that including a stylus with your tablet means you failed—or, at least that's what KGI analyst Ming-Chi Kuo thinks. Mr. Kuo predicts Apple will offer a stylus as an optional add-on for the rumored iPad Pro instead of being bundled with each purchase. Is the iPad getting a stylus? Maybe. When Apple introduced the original iPhone in 2007, he shot down the idea of using styluses saying they were cumbersome, easily lost, and not as intuitive as using our fingers. When he introduced the iPad the stylus was still MIA, and so far there haven't been any outward hints from Cupertino that one is on the way. Given that it's more precise than a person's fingers, a stylus can be more convenient to use that the combination of keyboard and mouse in some cases. 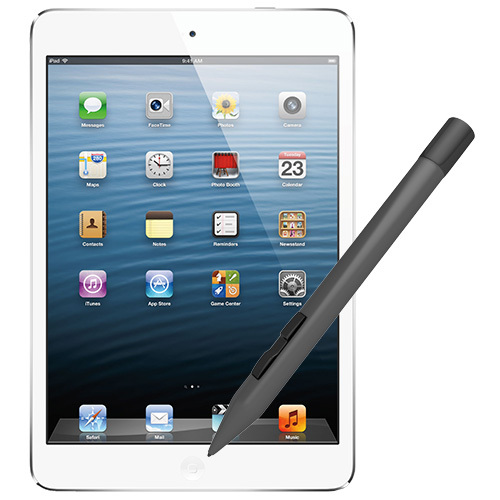 There, we believe Apple's stylus will improve the user experience of 12.9-inch iPad. Apple does hold several stylus-related patents, which does add a little validity to Mr. Kuo's prediction. On the other hand, companies often patent technologies in ways that obscure their real plans, or to block competitors from easily using the tech. There hasn't been any concrete proof yet that Apple is planning on releasing a larger display iPad model, either. Currently the company sells the 9.7-inch iPad and 7.9-inch iPad mini. Presumably the rumored 12.9-inch iPad Pro would offer more than just a bigger display. Mr. Kuo expects a stylus will help Apple draw in more business and education customers, too. "We believe that the stylus could improve the experience of users... and will likely help Apple develop specific customer groups such as the corporate sector and educational institutions," he said. Mr. Kuo's track record with Apple predictions is better than many other analysts, so it is interesting to see him on board with the idea of an iPad stylus. If he's right, don't expect Apple to offer up an explanation for the reversal. Those didn't come for iPod changes, iPad mini, or the larger screen iPhone, either.